The brown bear (Ursus arctos) is a large bear living in much of northern Eurasia and North America. It is smaller than the polar bear, but is the largest carnivore which lives entirely on the land. There are several recognized subspecies. The brown bear's range has shrunk, but it is still listed as a least concern species by the IUCN. Its total population is about 200,000. As of 2012, this and the American black bear are the only bear species not classified as threatened by the IUCN. However, many of the southern Asian subspecies are highly endangered. The smallest subspecies, the Himalayan brown bear, is critically endangered. It lives in just 2% of its former range, and poachers hunt it for its parts. The Marsican brown bear in central Italy is believed to have a population of just 30 to 40 bears. 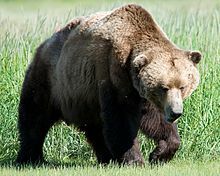 The brown bear's main range includes parts of Russia, Central Asia, China, Canada, the United States (mostly Alaska), Scandinavia and the Carpathian region (especially Romania), Anatolia, and Caucasus. The brown bear is a national and state animal in several European countries. It is the most widely distributed of all bears. ↑ 1.0 1.1 McLellan B.N; Servheen C. & Huber D. (2008). "Ursus arctos". IUCN Red List of Threatened Species. Version 2013.1. International Union for Conservation of Nature. Retrieved 2013-10-05. ↑ White, Paul. "Brown Bear". Transylvania Wildlife Project. Archived from the original on 19 May 2013. Retrieved 13 January 2014. This page was last changed on 16 May 2016, at 15:49.